Being Frugal and Making It Work: I'm Declaring My Sweet Independence This Summer! I'm Declaring My Sweet Independence This Summer! As a mom, summer is something that I look forward to all year long. It's the time that I get to spend each and every single day with my children, having fun with no time limits and no set schedule. 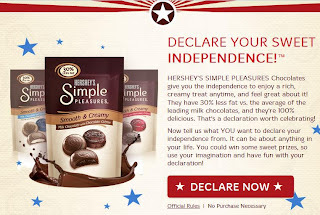 Hershey invites you to celebrate “Sweet Independence” this summer with the introduction of its new product, Hershey’s Simple Pleasures chocolates have 30 percent less fat than the average leading milk chocolates! With three mouth-watering flavors to choose from, including Milk Chocolate with Chocolate Cream (my favorite), Milk Chocolate with Vanilla, and Dark Chocolate with Chocolate Cream, there is sure to be a flavor that you will love. A hard Hershey's chocolate shell with a creamy center equals perfection! 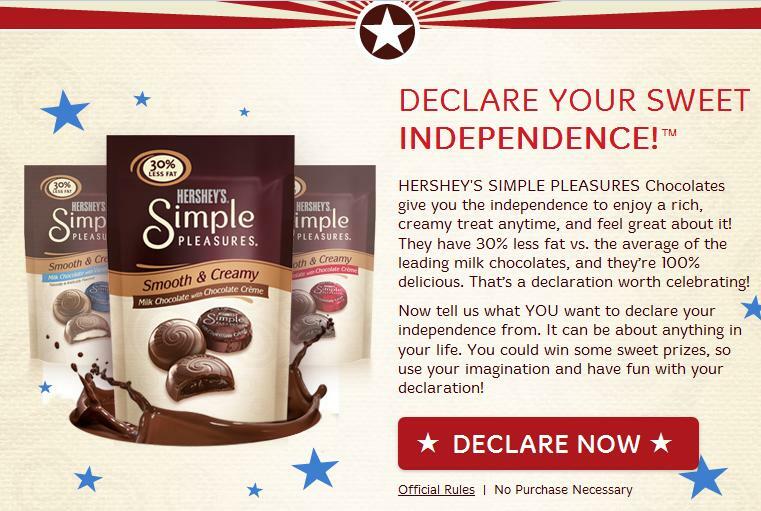 How will I declare my "sweet independence" this summer? I'm going to enjoy every moment of every day. From swimming at the beach, boating at the lake, summer BBQ's, and my favorite summer treats: ice cream and watermelon! It's all about making the most of each moment - it's the little things that matter most! What do YOU want to declare your independence from? It can be about anything in your life. Enter your deceleration on Hershey’s Simple Pleasures Facebook Page, and you could win some "sweet" prizes like a $100 gift card, Hershey’s Simple Pleasures chocolates and more. This is a spon­sored post through The Motherhood and Hershey’s. 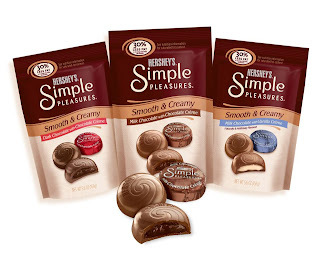 I received Hershey’s Simple Pleasures chocolates mentioned above for my review. I will definitely give this a try.